Worrowing Heights is in a central location at Jervis Bay and is the home of the landmark 250 acre property of “Worrowing” – one of few remaining rural properties in the Jervis Bay area. It hosts a choice of farm and eco nature style accommodation and is centrally located between Vincentia, Hyams Beach at Jervis Bay and Sanctuary Point on a saltwater lake at St Georges Basin. It is in a renowned location to native Australian animals, Eastern Grey Kangaroos and Wallabies in the wild or farm animals and is very popular with international visitors, families and couples. The property borders next to Jervis Bay National Park and cycleway which runs to Vincentia, along Collingwood Beach and into Huskisson where you will find many restaurants, side-walk Cafe’s for alfresco dining and the casual atmosphere of a sea side village with many shops and recreational activities. 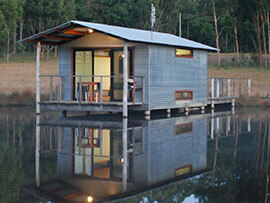 Something different, a studio style cabin with water birds on one side and kangaroos on the other. The perfect abode with access by timber boardwalk over wetlands and at a great location with the feeling of floating on the lake. 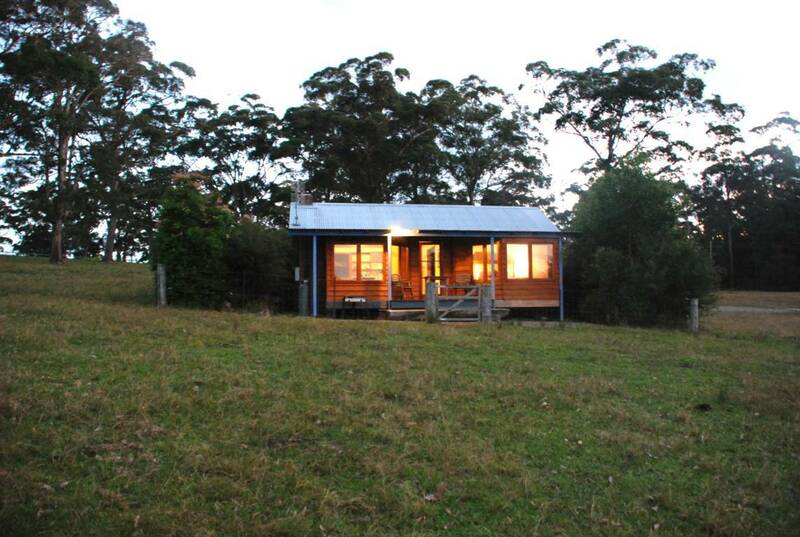 Secluded studio style cabin with double spa on a 250 acre property neighbouring Jervis Bay National Park with kangaroos and nature at your door. Ideal for nature lovers and bird watching. 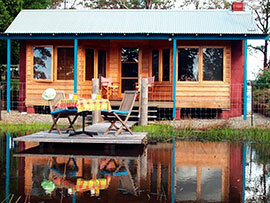 Peaceful honeymoon cottage is the perfect couples getaway. It has a cosy wood log fire and is in a secluded quiet setting overlooking your own private pond. 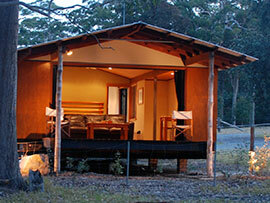 Watch animals enter the property on dusk and bushwalk on some of our walking trails or go to the beach 4 minutes away. The old charm of a horse stables and elevated to take full advantage of the views over the estate. 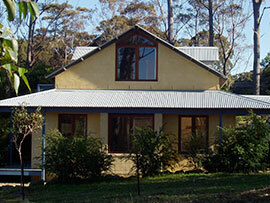 Centrally located in Jervis Bay only minutes to the beach, main towns, attractions and activities. A peaceful cottage and the perfect place to stay for families and groups. It has a cosy wood log fire and the perfect secluded quiet setting. Visit the farm animals, collect fresh farm eggs for breakfast or take one of our bushwalking trails around the estate. A peaceful nature location on a hinterland setting only minutes from the famous beaches of Jervis Bay. The location is popular for families, groups and international visitors who are looking for an opportunity to see the native animals that live on the property up close. 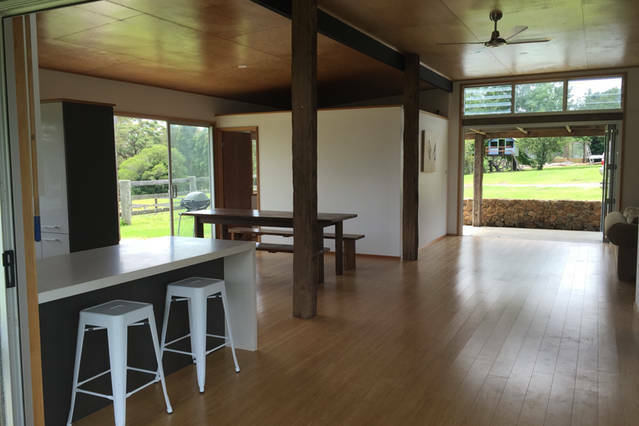 This 4 bedroom farm stay is the ideal family or group coastal hideaway nestled between the beach and lake with farm animals and kangaroos, neighbouring Jervis Bay National Park and only 4 minutes from the property to the many pristine beaches of Jervis Bay.